The Hollow-Pro™ Bent Shaft Hollowing Tool is designed specifically for use on hollow forms, particularly those with a small opening. 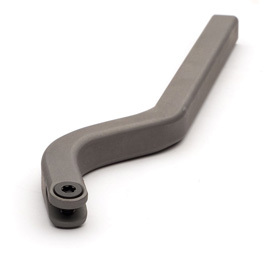 The 1/2" Bent Tool is recommended for use on pieces up to 8" dia. and for undercutting the first portion of larger hollow forms. Larger diameter work up to 16" dia. requires the 5/8" Bent Tool.